I recently spoke to top retail brands about their experience with attribution and one of the comments was particularly pertinent. Attribution is still a difficult topic for many companies as there isn’t one set way to attribute and this can be an extremely unsettling discussion point for any business. Attribution has left many businesses frustrated as they get lost in the technology and struggle to harness the value. As soon as ‘attribution’ is mentioned the conversation tends to be polarised on the details of the sharing algorithm and the technology used. While the attribution technology and the algorithm for sharing value across touchpoints is important, today I want to widen the lens on the subject and look at the three stages that make up the discipline of attribution and look at why this wider view is crucial to success. Without accurate and representative user journey data, an attribution algorithm is completely redundant. To get the best results from your attribution model, data needs to be collected from as many touchpoints as possible – online, offline and across all devices. That data then needs to be joined and structured correctly, and linked to a single user, to create the most accurate user journey available. While it will never be possible to see every single step a user makes, capturing a high percentage will allow you to map out ‘typical’ user journeys and gain insight that can infer actions later on. Think of the data as the building blocks, and each channel accounting for a specific part of a building – the foundations, the roof, the plumbing. The more building blocks you are able to collect and join, the more robust and complete your building – or in this case your attribution model – will be. Once the foundations are complete, we can move on to the science. The sharing algorithm’s purpose is to share sale value between touchpoints, and while there are many ways of doing this and several layers of complexity that can be added, two common models are based on propensity or engagement. In laymen’s terms, a propensity model focuses on the impact each touchpoint has on conversion rate whilst an engagement model values touchpoints based on engagement each one drives with a user. As the number of devices that shoppers have continue to grow, it becomes more essential to have an accurate attribution model. In addition, separating causality – the marketing activity that actually drove the purchase – from causation – the activity that occurs at the same time as a conversion – is paramount. The modern marketer has many campaigns live at any given time, so understanding exactly what touchpoints influenced a user and how much they affected their purchasing decision is the key to success going forwards. Now that we understand the impact of the varying touchpoints, we can apply weightings to each of those channels to attribute value across a user journey and move on to the next step. Once the algorithm has shared the sale value between touchpoints, it is important to ensure that you activate the data. The easiest way to use this data effectively is to feed the information into third party tools, such as PPC and programmatic bid optimisers, to automate channel optimisation. Automation will save valuable time and resource, and also means that channels can be accurately optimised, down to the most granular level, in the context of the full user journey, rather than relying on a siloed view. However it’s also important to construct reporting outputs and views of the data that serve your core goals and objectives. A huge spreadsheet with lots of numbers is unlikely to inspire any action and take a long time to decipher, which is why so many marketers continue with basic analytical tools that they are accustomed to working with. Work closely with your channel managers and attribution provider to create tailored visual reports and customised dashboards that display the results each part of the business needs, in a way that can be easily digested and actioned. In addition, the way attribution data is stored and accessed means that you can also use the insights to support your business goals and drill down to product specific insights or analyse the way that consumers interact with your brand. This will enable you to not only better understand your customers, but also better understand consumers that are not buying from you. What can we do to influence customer journey Y in the future? How does my digital marketing impact in-store sales? Which affiliates add the most value? Which marketing channels attract new customers? Does my top performing channel create long term customers? Or short term? Which channel drove the most sales for product X? Did customers purchasing product Y, also buy product X? Answering these questions will not only enable you to maximise the efficiency and performance of your marketing strategy, but also validate spend on attribution to stakeholders quickly. With the right outputs in place, the transparency of the results from your algorithm will enable you to better understand what is working and take action on areas that need improvement. You should now be able to gain access to the results at a time that suits you, rather than waiting on monthly or quarterly reports to take action on the insights. Step three is all about making sense of the data and taking action. If there is no action on your big data then that is really all it is – a pile of data. The term ‘attribution’ is almost unhelpful when trying to explain the value that it delivers, which is why many get caught up in the technology. If you brought a brand new television, it doesn’t matter how ‘smart’, how big or how high its resolution, you still need a network to provide entertaining content, and someone to watch and enjoy that content, in order to gain real value and justify the spend. The same goes for your sharing algorithm – any technology is redundant without a quality input and an output that delivers value. While there are many other factors to consider that are unique to each business, if you go beyond the algorithm and begin to view attribution as an all-encompassing solution under this “build, model, do” methodology, you will be well on your way to achieving your ultimate goal, whether that is to automate the optimisation of your marketing channels, validate your spend to stakeholders, feed specific business goals or deliver a relevant and contextual omnichannel experience to your customers. 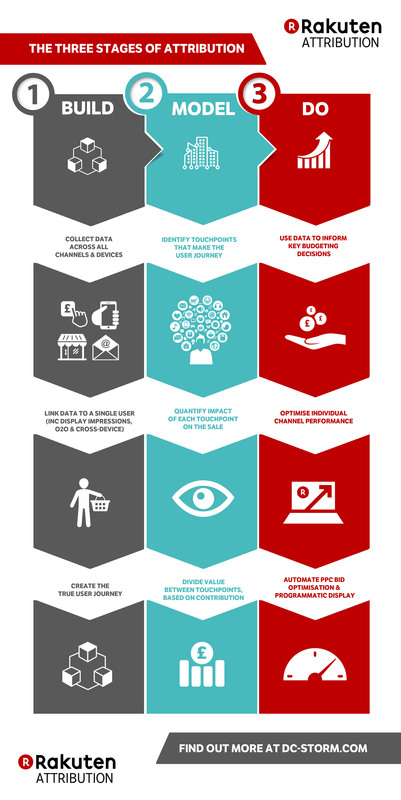 You can also view the full Rakuten Attribution ‘Build, Model, Do’ infographic by clicking the image below. The rise of native apps is one of the biggest threats to Google’s dominance, but the search giant isn’t sitting idly by. In fact, slowly and sometimes quietly, it’s increasingly working to extend its influence into the apps Googlebot can’t reach. It’s no surprise that when an industry explodes, its marketing channels are inundated with new players and technologies. This can also mean high fragmentation among systems as companies try to capitalise on every tool available to them in a rapidly expanding new ecosystem. When it comes to mobile marketing, this phenomenon couldn’t be more true in the domain of data capture.